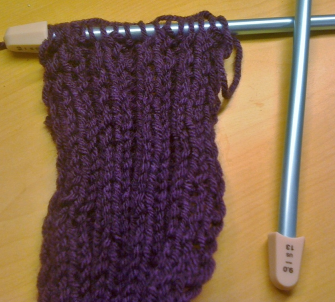 For beginning knitters, the first two things to master (besides cast on/cast off) are Knit and Purl. You can knit one row, purl the next row in order to get a straight, uncurling weave, or you can knit one row, knit the next row for a stretchy knitted fabric that curls in on itself. 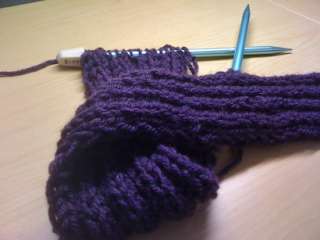 Or you can do stockinette stitch, rotating knits and purls across the row, and this gives you a fabric that bunches in on itself, like the cuff of a sleeve or sock, making it thicker but stretchier. 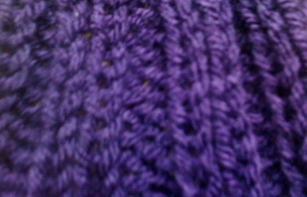 I decided to make a purple scarf using this stitch. It's going to be really thick and cozy.